At 6 feet 10 inches tall, Kalin is a force on the basketball court and received multiple college offers before deciding on Kent State. KENT, Ohio (KTHV) - Little Rock native Kalin Bennett is making headlines after he became the first student-athlete with autism to be recruited at the NCAA Division I level. According to cleveland.com, Bennett will enroll at Kent State next summer, though he was also recruited by several other colleges. 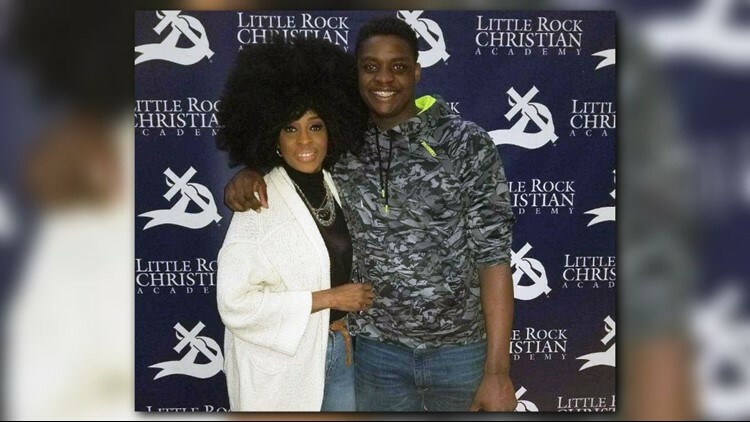 Bennett graduated last May from Little Rock Christian and is preparing to move 900 miles away from home, living on a campus with 23,00 students. At 6 feet 10 inches tall, Kalin is a force on the basketball court and received multiple college offers before deciding on Kent State. Off the court, he's worked to overcome an entirely different set of obstacles. "It's just a day they said I would never have," Sonja Bennett said on her son's graduation day. At six months old, Sonja noticed something was not quite right with her youngest son. She took Kalin to several doctors and, soon, he was diagnosed with autism. "When doctors tell you 'no' or 'this can't be done' — fight," Sonja said. "Believe in your heart and believe in your child." That's exactly what Ms. Bennett did in the years following her son's diagnosis. "[I] kind of had a hard time talking to people, making conversation with people," Kalin said. "That was probably one of the hardest challenges." "Now look at him," Sonja said.